Petrosul’s supply comes from 52 oil and gas companies and is sourced at 35 gas plants in British Columbia and Alberta. Petrosul and its suppliers have long term forming arrangements with companies that produce some of the most preferred solid sulphur products including rotoform, polish prills, GX granules, Devco II Process wet prills, and Enersul wet prills. Petrosul utilizes both national rail carriers – CN and CP – making Petrosul a very reliable supplier. 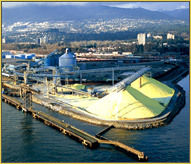 Petrosul has sulphur storage and loading capacity at Vancouver Wharves and Pacific Coast Terminals, and a combined tidewater storage capacity of approximately 100,000 tonnes.